Mr. Oliver Cardinal passed in peace Sunday, November 4th 2018 at the age of 95 years. He was predeceased by his wife Cecilia Ann Cardinal, brothers Julian and Victor Cardinal, sister Elizabeth Decoine, Eliza Auger, Cecile Bremner, Daughter Mabel Mary Culford, Grandson Gerald Yellowknee, Grand daughter Shannon Joyce Yellowknee, Jeffrey Cardinal, Great grand daughter Latoya Yellowknee. 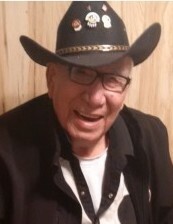 Survived by one sister Ida Yellowknee, one brother George Cooks Gladue, numerous nieces and nephews, he was a proud father of 10 children, numerous grandchildren, great grandchildren, great great grandchildren. He will be fondly remembered by his family and friends as a man with a great sense of humour and passion for life, trapper, horseman, logger, and various others, too many to remember. A Wake Service will begin at 1:00 P.M. on Thursday, November 8, 2018 at the Wabasca Community Hall. A Funeral Mass will follow at 11:00 A.M on Saturday, November 10 , 2018 at the Wabasca Community Hall.